Hi all! Back at E3, we had announced that we will be releasing an all-in-one Surround Sound System for the PS3 system with built-in subwoofer. A device made for the ultimate gamer, the Surround Sound System will be available next week in the U.S. and Canada. It’s perfect for use with games and Blu-ray movies and more importantly, is easy to use. You’ll be able to enjoy immersive audio by simply placing the Surround Sound System in front of the television and connecting it to the PS3 system with the optical digital cable. 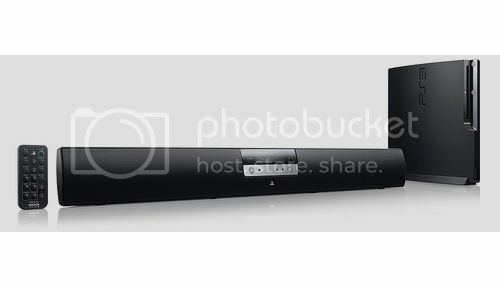 The sleek design of the Sound Bar compliments the design of your PS3. To learn more about the features and specifications of this Sound Bar, visit our web site. Many retailers across the country have it on display as well. Visit one of the online retailers listed on our website for more info. Enjoy! Tokyo, June 16, 2010 – Sony Computer Entertainment (SCE) today announced that it will release a subwoofer built-in, all-in-one Surround Sound System for the PlayStation®3 (PS3™) system in fall 2010 in Japan, North America, Europe/PAL territories, and Asian countries/regions at a recommended retail price of 19,800 yen (including tax), US$199, and €199 respectively. Users will be able to enjoy immersive audio on the PlayStation®3 system, including upcoming games supporting PlayStation®Move motion controllers, Blu-ray movies, as well as stereoscopic 3D content by simply placing the speaker in front of the television and connecting it to the PS3 system with the optical digital cable. The Surround Sound System utilizes cutting-edge technologies, including Sony’s S-Force PRO Front Surround Sound that generates rich realistic surround sound over one front speaker. Delivering a dynamic sound environment with audio virtually coming from all directions, the Surround Sound System will immerse users into a cinema-like experience in the living room, making them feel like they are actually in the game or movie itself. Bringing in SCE’s expertise in both entertainment and technology acquired from developing games, four sound fields of the speaker system have been designed with the help of SCE’s expert game sound designers, to optimize the cinematic experience of all forms of entertainment. The Surround Sound System comes with two audio inputs − an optical audio input for connecting high-end entertainment systems including PS3, and an analog audio input for connecting portable devices like the PSP® (PlayStation®Portable) system to enjoy listening to music in the living room. The form factor of the system features a sleek and casual design that matches perfectly with the PS3 system, and delivers dynamic sound without the physical space required by a traditional home theater system. Guests online: 416. Total online: 418.